Long-Lived Assets. 1. How the matching principle underlies the methods used to account for long-lived assets. Download "Long-Lived Assets. 1. How the matching principle underlies the methods used to account for long-lived assets." 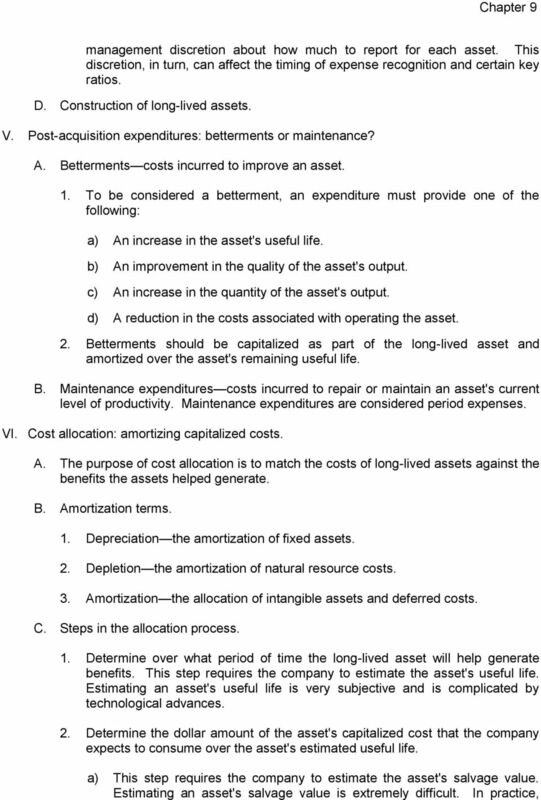 1 CHAPTER 9 Long-Lived Assets SYNOPSIS In this chapter, the author discusses (1) accounting for the acquisition, use, and disposal of long-lived assets, and (2) management's incentives for selecting accounting procedures associated with long-lived assets. The specific issues discussed in accounting for long-lived assets include the costs to capitalize when the asset is acquired, the treatment of postacquisition costs, cost allocation, and the disposal of long-lived assets. The discussion of cost allocation focuses on the alternative depreciation methods for fixed assets and the activity method for natural resources. The author also discusses intangible assets, deferred costs, and international financial reporting standards as they relate to property, plant and equipment. The ethics vignette considers a case where management's methods of accounting for long-lived assets may be within the guidelines of GAAP but still leave the statement reader with vague and insufficient information. 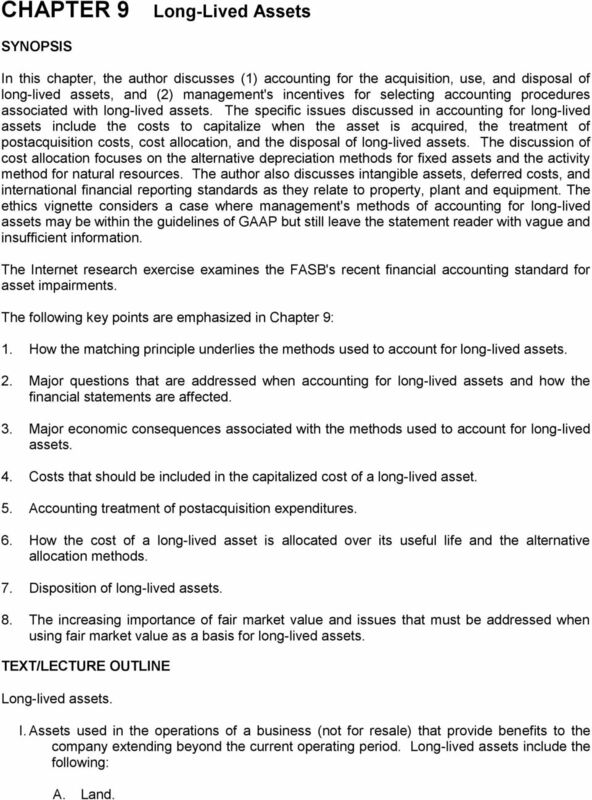 The Internet research exercise examines the FASB's recent financial accounting standard for asset impairments. The following key points are emphasized in Chapter 9: 1. How the matching principle underlies the methods used to account for long-lived assets. 2. 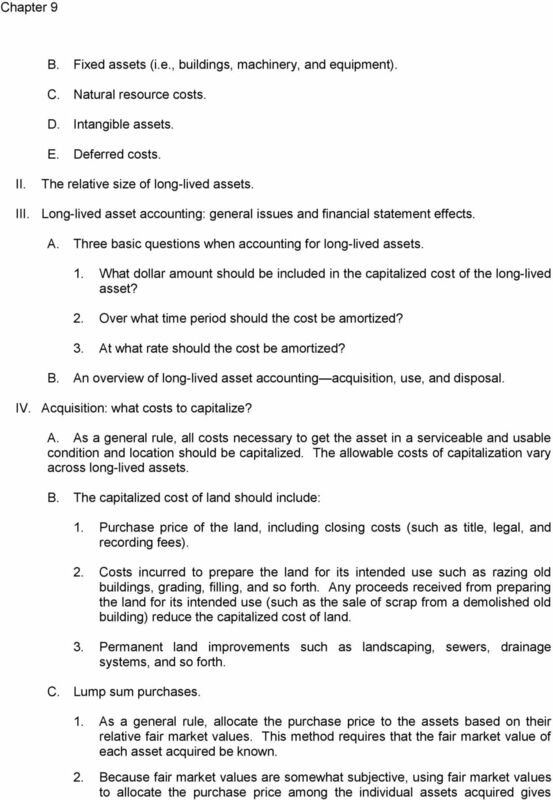 Major questions that are addressed when accounting for long-lived assets and how the financial statements are affected. 3. Major economic consequences associated with the methods used to account for long-lived assets. 4. Costs that should be included in the capitalized cost of a long-lived asset. 5. Accounting treatment of postacquisition expenditures. 6. How the cost of a long-lived asset is allocated over its useful life and the alternative allocation methods. 7. Disposition of long-lived assets. 8. The increasing importance of fair market value and issues that must be addressed when using fair market value as a basis for long-lived assets. TEXT/LECTURE OUTLINE Long-lived assets. I. Assets used in the operations of a business (not for resale) that provide benefits to the company extending beyond the current operating period. Long-lived assets include the following: A. Land. 4 many managers simply assign a salvage value of zero to assets because of the difficulty in estimating a reasonable salvage value. b) The dollar amount of the asset's capitalized cost that the company expects to consume over the asset's estimated useful life is called the asset's depreciation base (for fixed assets). The depreciation base equals the capitalized cost of the asset less its estimated salvage value. 3. Select a cost allocation method. a) The choice of cost allocation methods does not affect the dollar amount amortized over a long-lived asset's estimated useful life. The dollar amount that is amortized over the asset's life is always its depreciation base. b) A cost allocation method determines the rate at which an asset's capitalized cost will be amortized to future periods. That is, the total amount amortized over an asset's life is the same across allocation methods, but the timing of the allocations will differ. D. Cost allocation (depreciation) methods. 1. Straight-line method. a) Allocates an equal amount of the depreciation base to each period. b) Depreciation expense equals: (Capitalized cost minus Salvage value) Estimated life in years. 2. Double-declining-balance method. a) Allocates larger amounts of an asset's depreciation base to the earlier periods of the asset's life than to the later periods. b) Salvage value is not used to calculate depreciation expense, but the asset's book value cannot be reduced below its salvage value. 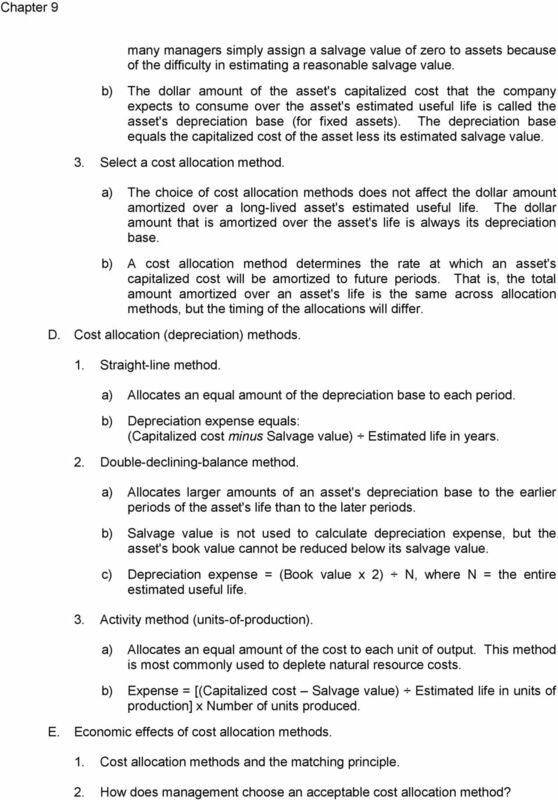 c) Depreciation expense = (Book value x 2) N, where N = the entire estimated useful life. 3. Activity method (units-of-production). a) Allocates an equal amount of the cost to each unit of output. This method is most commonly used to deplete natural resource costs. b) Expense = [(Capitalized cost Salvage value) Estimated life in units of production] x Number of units produced. E. Economic effects of cost allocation methods. 1. Cost allocation methods and the matching principle. 2. How does management choose an acceptable cost allocation method? 5 3. Depreciation methods for income tax purposes. VII. Disposal: retirements, sales, and trade-ins. A. 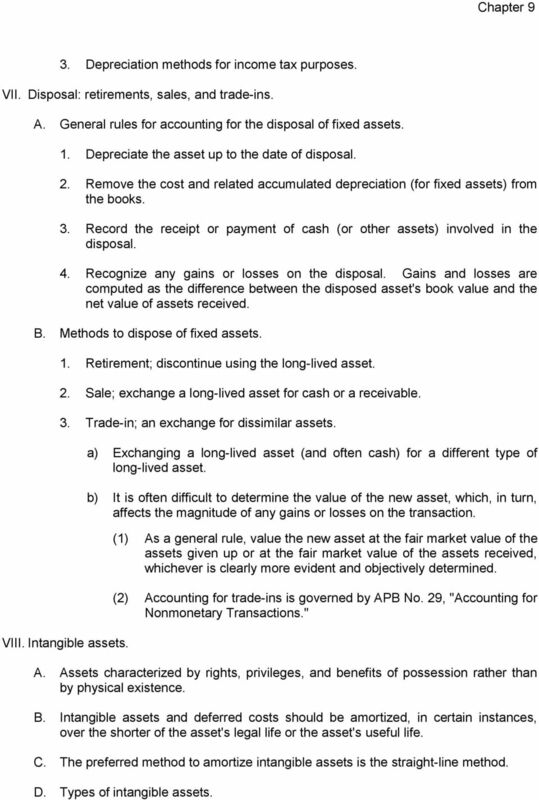 General rules for accounting for the disposal of fixed assets. 1. Depreciate the asset up to the date of disposal. 2. Remove the cost and related accumulated depreciation (for fixed assets) from the books. 3. Record the receipt or payment of cash (or other assets) involved in the disposal. 4. Recognize any gains or losses on the disposal. Gains and losses are computed as the difference between the disposed asset's book value and the net value of assets received. B. Methods to dispose of fixed assets. 1. Retirement; discontinue using the long-lived asset. 2. Sale; exchange a long-lived asset for cash or a receivable. 3. Trade-in; an exchange for dissimilar assets. VIII. Intangible assets. a) Exchanging a long-lived asset (and often cash) for a different type of long-lived asset. b) It is often difficult to determine the value of the new asset, which, in turn, affects the magnitude of any gains or losses on the transaction. (1) As a general rule, value the new asset at the fair market value of the assets given up or at the fair market value of the assets received, whichever is clearly more evident and objectively determined. (2) Accounting for trade-ins is governed by APB No. 29, "Accounting for Nonmonetary Transactions." A. Assets characterized by rights, privileges, and benefits of possession rather than by physical existence. B. Intangible assets and deferred costs should be amortized, in certain instances, over the shorter of the asset's legal life or the asset's useful life. C. The preferred method to amortize intangible assets is the straight-line method. D. Types of intangible assets. 6 1. Copyrights exclusive rights over musical or artistic works. The legal life is the life of the creator plus an additional 50 years. 2. Patents provide the holder exclusive rights to use, manufacture, or sell a product or process. The legal life is 10 years. 3. Trademarks (or trade name) a word, phrase, or symbol that identifies an enterprise or product. The legal life is 20 years but the exclusive right can be renewed indefinitely. 4. Computer software development costs. 5. Goodwill The nature of goodwill and the methods used to account for it are discussed in Chapter 8. E. Organizational costs - costs incurred prior to the start of a company's operations that are necessary to allow the company to begin operations. Such costs typically include legal and accounting services, licenses, underwriting fees, titles, and so forth. F. Research and development costs. 1. Governed by SFAS No. 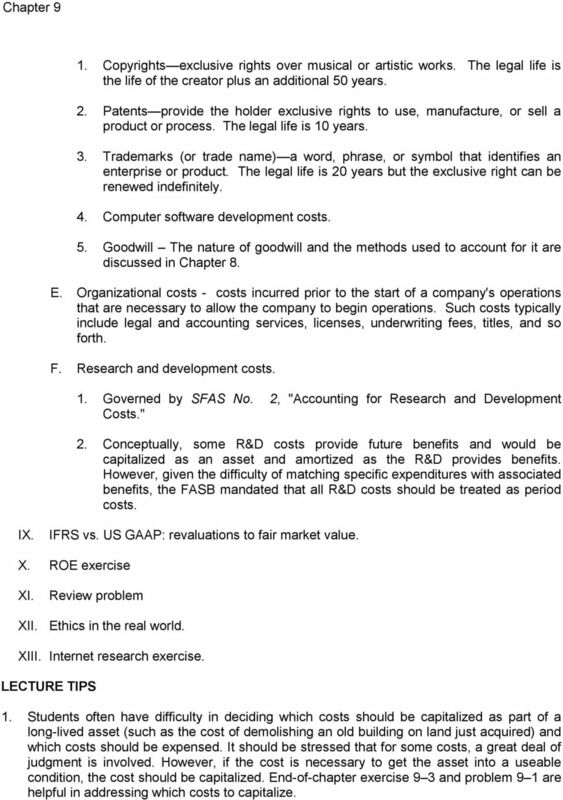 2, "Accounting for Research and Development Costs." 2. Conceptually, some R&D costs provide future benefits and would be capitalized as an asset and amortized as the R&D provides benefits. However, given the difficulty of matching specific expenditures with associated benefits, the FASB mandated that all R&D costs should be treated as period costs. IX. IFRS vs. US GAAP: revaluations to fair market value. X. ROE exercise XI. Review problem XII. Ethics in the real world. XIII. Internet research exercise. LECTURE TIPS 1. Students often have difficulty in deciding which costs should be capitalized as part of a long-lived asset (such as the cost of demolishing an old building on land just acquired) and which costs should be expensed. It should be stressed that for some costs, a great deal of judgment is involved. However, if the cost is necessary to get the asset into a useable condition, the cost should be capitalized. 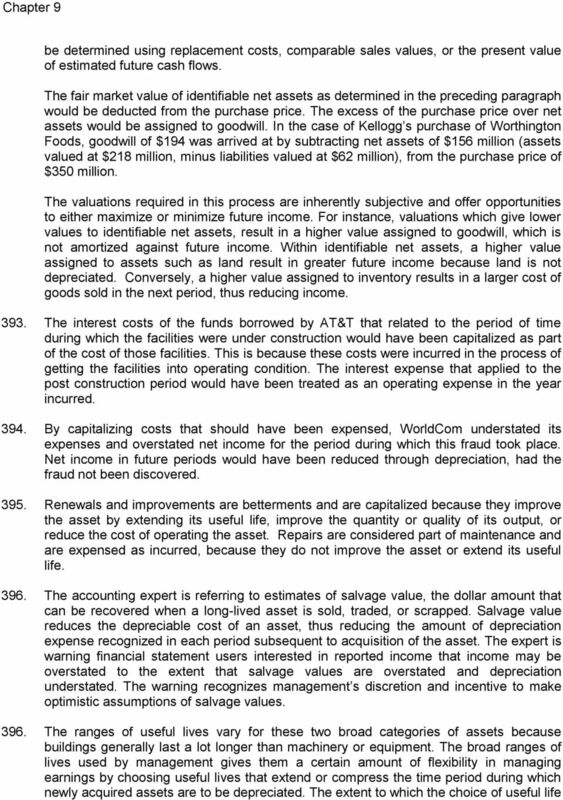 End-of-chapter exercise 9 3 and problem 9 1 are helpful in addressing which costs to capitalize. 9 will impact current year net income is usually minor unless there was a relatively large dollar amount of new asset acquisitions An analyst comparing PepsiCo to Coca-Cola would want to factor in the differences in the useful lives assigned to assets being depreciated. The change in depreciation schedules is a way to make earnings look better when they have not improved at all. The depreciation is not relevant to cash flow, and PepsiCo s response to any comments about the change in their depreciation schedule could be deflected by focusing on cash flow. 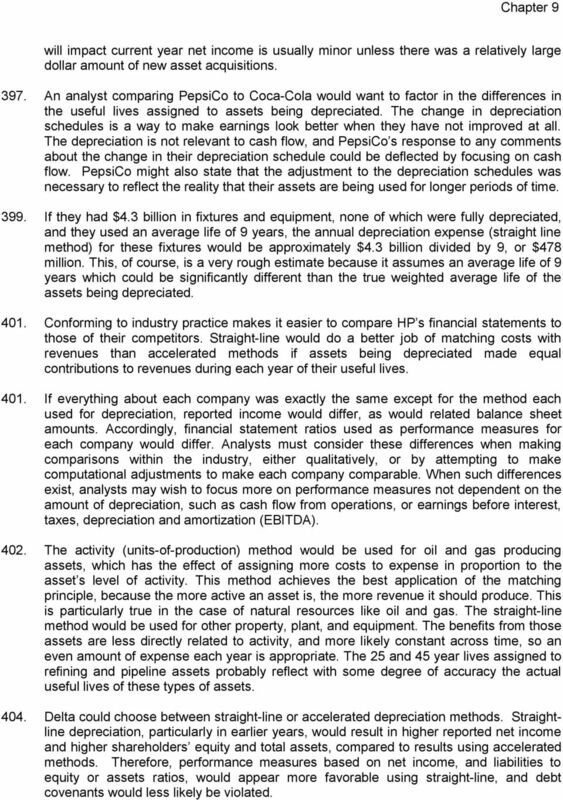 PepsiCo might also state that the adjustment to the depreciation schedules was necessary to reflect the reality that their assets are being used for longer periods of time If they had $4.3 billion in fixtures and equipment, none of which were fully depreciated, and they used an average life of 9 years, the annual depreciation expense (straight line method) for these fixtures would be approximately $4.3 billion divided by 9, or $478 million. This, of course, is a very rough estimate because it assumes an average life of 9 years which could be significantly different than the true weighted average life of the assets being depreciated Conforming to industry practice makes it easier to compare HP s financial statements to those of their competitors. Straight-line would do a better job of matching costs with revenues than accelerated methods if assets being depreciated made equal contributions to revenues during each year of their useful lives If everything about each company was exactly the same except for the method each used for depreciation, reported income would differ, as would related balance sheet amounts. Accordingly, financial statement ratios used as performance measures for each company would differ. Analysts must consider these differences when making comparisons within the industry, either qualitatively, or by attempting to make computational adjustments to make each company comparable. When such differences exist, analysts may wish to focus more on performance measures not dependent on the amount of depreciation, such as cash flow from operations, or earnings before interest, taxes, depreciation and amortization (EBITDA) The activity (units-of-production) method would be used for oil and gas producing assets, which has the effect of assigning more costs to expense in proportion to the asset s level of activity. This method achieves the best application of the matching principle, because the more active an asset is, the more revenue it should produce. This is particularly true in the case of natural resources like oil and gas. The straight-line method would be used for other property, plant, and equipment. The benefits from those assets are less directly related to activity, and more likely constant across time, so an even amount of expense each year is appropriate. The 25 and 45 year lives assigned to refining and pipeline assets probably reflect with some degree of accuracy the actual useful lives of these types of assets Delta could choose between straight-line or accelerated depreciation methods. Straightline depreciation, particularly in earlier years, would result in higher reported net income and higher shareholders equity and total assets, compared to results using accelerated methods. Therefore, performance measures based on net income, and liabilities to equity or assets ratios, would appear more favorable using straight-line, and debt covenants would less likely be violated. 10 405. By using accelerated instead of straight-line depreciation FedEx saves taxes of 37.6% of the excess of accelerated depreciation over straight-line ($3.9 billion $1.8 billion) x 37.6%, or $.8 billion The IRS took the position that the work on the jet engines should be treated as betterments rather than as routine maintenance. If FedEx has a tax rate of 37.3%, treating these costs as expenses increases FedEx s cash flow (by way of reduced income tax payments) by 37.3% of the amount of the expenditures in question There would have been a one time gain recorded on the sale of these assets. 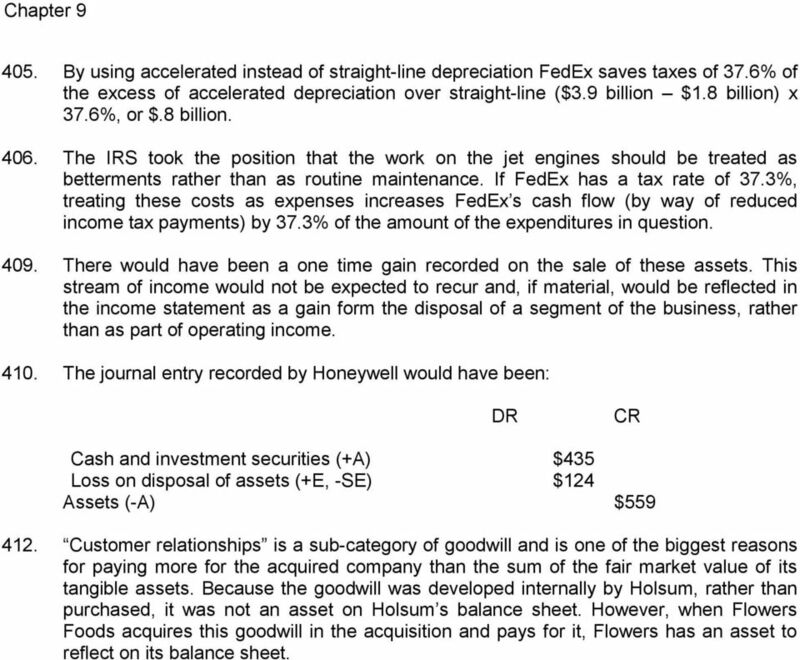 This stream of income would not be expected to recur and, if material, would be reflected in the income statement as a gain form the disposal of a segment of the business, rather than as part of operating income The journal entry recorded by Honeywell would have been: DR CR Cash and investment securities (+A) $435 Loss on disposal of assets (+E, -SE) $124 Assets (-A) $ Customer relationships is a sub-category of goodwill and is one of the biggest reasons for paying more for the acquired company than the sum of the fair market value of its tangible assets. Because the goodwill was developed internally by Holsum, rather than purchased, it was not an asset on Holsum s balance sheet. However, when Flowers Foods acquires this goodwill in the acquisition and pays for it, Flowers has an asset to reflect on its balance sheet.